Breast cancer is one of the common cancer types occurring in women globally. With the increase in its incidence, the demand for ABUS is also increasing. Because of its effectiveness in diagnostic results, ABUS is widely preferred by oncologists. The growing number of breast cancer cases has led many countries to perform early breast cancer screening. For instance, the breast cancer screening rate has spurred in many developed countries such as France, Germany, and Italy in recent years. With the growing incidences of breast cancer cases, the increasing demand for breast imaging products will drive the market's growth over the forecast period. 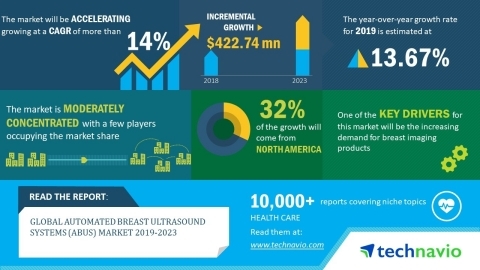 In this report, Technavio highlights the growing focus on the developmentof integrated and innovative ABUS as one of the key emerging trends in the global automated breast ultrasound systems market. Many vendors are developing affordable integrated products that can help medium and small-sized end users. Such integrated products help clinicians precisely understand the medical condition of a patient. For example, Koninklijke Philips (News - Alert) recently launched its integrated breast ultrasound solution. This integrated ultrasound solution comes with various features to provide superior screening and diagnosis. One of the highlights includes PureWave crystal technology that provides detailed resolution and tissue uniformity to understand the root cause of the problem. This growing trend of developing integrated and innovative solutions among vendors will boost the growth of the market globally. "Vendors are expanding their reach by providing their products to end-users in various regions due to the growing demand. For instance, in 2010, Siemens (News - Alert) Healthineers introduced a new ABUS, ACUSON S2000 at Jaslok Hospital in Mumbai, India for imaging patients with dense breast tissue or with a history of breast disease. Similarly, Benson Radiology, a diagnostic and interventional radiology provider with its North Adelaide clinic, is providing a diagnosis for patients with dense breast tissue using GE Healthcare Invenia ABUS. The rise in a number of diagnostic facilities for breast cancer will drive the growth of the market during the forecast period", says an analyst at Technavio.